During his turn, Gu Yong can discard two cards to draw a card. At the end of his turn, Gu Yong can reveal his hand. If all his cards are the same color, he can choose X players and they all draw a card. X is how many cards are in his hand. Gu Yong can use "Caution" as often as he likes during his action phase. 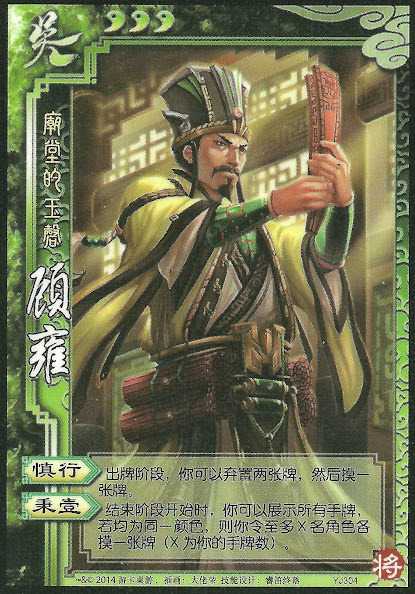 If Gu Yong only has one card at the end of his turn, he will always be successful with "Control" since the one card will always have the same color as itself. Gu Yong can target himself with "Control" to draw.